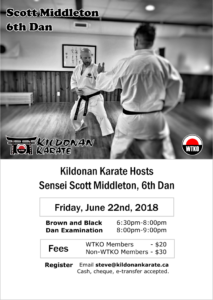 Kildonan Karate is proud to once again host S ensei Scott Middleton, 6th Dan, International Director for WTKO. This is a “one night only” event for all brown and black belt Shotokan Karate practitioners. Everyone is welcome, regardless of affiliation! Cash, cheque, and e-transfer accepted! Sensei Scott Middleton, 6th Dan, has been training in Shotokan Karate for 30 years, and has been teaching at his dojo, Traditional Karate of Brandon, since 1992. Sensei Middleton is the WTKO Canada National Director, WTKO International Director, and member of the WTKO Executive Committee. He is an Certified Instructor Graduate of the WTKO Kenshusei Program and holds the qualifications of Class A Instructor, Class A Examiner, and Class A Judge. Sensei Middleton is a highly sought after Shotokan instructor, and has taught at various seminars and camps around the world. His classes are well-planned, well-presented, energetic and thought-provoking.